"Paint should not be applied thick. It should be like a breath on the surface of a pane of glass." Working within a carefully chosen palette of closely related colors, the Tonalists aspired to emulate musicality and inspire contemplation. By arranging color and forms, they believed that landscapes could evoke emotion and suggest deep, cosmic harmonies. Their gentle color schemes and softly brushed contours quickly became popular, influencing musicians and poets. Unlike their contemporaries, such as the Luminists and the Impressionists, the Tonalists favored cool palettes and often chose nocturnal or modest scenes of contemplative quiet. The simplicity and attention to composition found in Tonalism contributed to the abstractions that would develop in 20th-century American modernism. Inspired by strategies of musical composition, the Tonalists developed theories of color and line that they believed heightened the symbolic potential of landscape painting. Building on the example of the Hudson River School artists, they rearranged elements of the observed world in order to better convey musical and visual harmonies. Tonalist painters emphasized both the formal components of their work - color, line, and shape - and the symbolic meaning conveyed to the viewer. Bypassing narrative as a means of communicating spirituality, their example was instrumental to the development of early-20th-century abstraction. The aesthetics of Tonalist painting appealed to Pictorialist photographers who wanted to establish photography as an artistic medium. By manipulating their exposures and printing, these photographers were able to simulate the atmospheric effects and tonal relationships that defined the style. This emphasis on process would influence generations of photographers, even after this style faded from popularity. The term Tonalism describes a style of American art focused primarily on depicting landscape, emphasizing tonal values to express mood or poetic feeling. Its origins date back to the early 1870s, when James McNeill Whistler, an innovator who would come to be identified with the style, began using musical terms like "nocturnes," to title his work. At this time, he started looking at paintings as if they were like musical compositions, arranging tonal values and colors as a composer would score a series of related notes. The style caught on quickly: by the 1890s, the term "Tonal School" was used to describe artists who emphasized closely-related palettes and in 1910 the modernist critic Sadakichi Hartmann wrote, "Tone is the ideal of the modern painter. It is his highest ambition. It is the powerful subduer of all the incongruities of modern art." Shortly thereafter, however, the movement faded from popularity, replaced by more abstract approaches to modernism. One of the iconic (and often parodied) paintings, commonly known as "Whistler's Mother," this work is both a portrait of resolute poise and severity and a color study in delicately modulated shades of black and gray. The title, with its musical vocabulary, suggests that the arrangement of tones and shapes was of primary interest to Whistler, even as he painted a likeness of his own mother. Seated primly and staring straight ahead, her folded hands holding a white handkerchief and her feet resting on a footrest, the woman conveys a sense of alert and self-contained repose. The palette is similarly restrained, with broad black and grey planes contrasted only by the asymmetrical black and white pattern of the curtain on the left side of the frame. With this monochromatic color scheme that displays tones of gray, from the greenish gray of the floor to the slate gray of the drape, we witness the development of the Tonalist style. And, with its melancholic color scheme, the interior takes on an elegiac feeling, becoming a kind of visual poem on age; as Whistler explained, "As light fades and the shadows deepen, all petty and exacting details vanish, everything trivial disappears, and I see things as they are in great strong masses: the buttons are lost, but the sitter remains." In this poetic description, we see the simplification of the forms and the quietness of Whistler's palette as meaningful signifiers; his minimalism sought to present the essence of the subject and create a contemplative mood that allowed it to be best appreciated. This idea of an essential truth that was more evocative than literally illusionistic would influence the development of American modernism; it allowed artists the freedom to abstract their subjects in the quest for more evocative suggestion than outright description. While the Tonalists were inspired by musical composition, their work also impacted composers; this painting had a profound influence on Claude Debussy, who described his Nocturnes (1899) composition as the musical equivalent of "what a study in grey would be in painting." Today, this image has become part of cultural consciousness, featured in films like Babette's Feast (1986), Bean (1997), and I Am Legend (2007), as well as television episodes of The Simpsons and America's Next Top Model, Cycle 5. It has evoked countless reproductions and parodies. This landscape provides the barest indications of its setting in London's Cremona Gardens, emphasizing instead the falling flares of a firecrackers that illuminate the inky black sky and reflect in the river below. The title demonstrates his compositional approach to the nearly-abstract painting; as Whistler explained, "By using the word 'nocturne' I wished to indicate an artistic interest alone, divesting the picture of any outside anecdotal interest which might have been otherwise attached to it. A nocturne is an arrangement of line, form and color first." Whistler painted six Nocturnes depicting this park, which with its theatres, restaurants, maze, and indoor bowling alley, was a popular gathering spot. However, rather than painting scenes of social activity, he focused on the firework displays or moonlit scenes of the garden. In the foreground, several women can be seen standing on the shore, their forms distinct but almost transparent. The abstract and unfinished nature of this depiction led the art critic John Ruskin to describe this particular work to a "pot of paint" thrown in the "public's face." Claiming this libelous assault damaging to his career, Whistler sued. The resulting trial became a highly publicized debate on the nature of art, as Whistler argued the Aesthetic Movement's belief in "art for art's sake." This defense claimed a purpose for painting beyond mimesis: rather than representing a story, a historical incident, or recording nature, art was an interplay of formal qualities such as line and color. Talent (and accordingly, value) was in the expressionist and aesthetic inventiveness of the artist, not the ability to illusionistically recreate the seen world. During the trial, when asked if the work was meant to be a view of Cremorne, Whistler's responded, "If it were A View of Cremorne it would certainly bring about nothing but disappointment on the part of the beholders. It is an artistic arrangement. That is why I call it a nocturne." This emphasis on the notion of arrangement underscores the formal direction of Whistler's style. 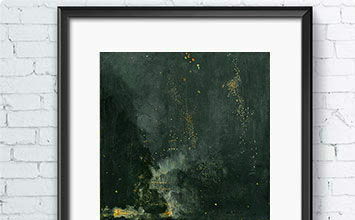 Indeed, the tonal variations of black and gold (such as the inky black on the left where a few gold embers fall, varying to the pale bluish slate of the water) are the painting's primary subject. This definition of painting as an artistic arrangement impacted the development of Tonalism but also had a long-lasting effect upon the development of Modernism as it blazed a trail away from the traditions of illusionism and Realism. Twatchman uses the natural forms of this riverscape to create an atmospheric realm of harmony and balance, giving emotional power to this otherwise unassuming landscape. The horizontal lines of the riverbank and the misty green grey hill in the background evoke the gentle merging of the stream of Béthune, as it flows into the Arques River. The viewer is led into this scene by a foreground border of long reeds and grasses that provide a counterbalance of organic vertical lines, while the reflection of the hill divides the river horizontally between lighter and darker tones of gray. The broad expanses of matte shades of subdued blues and greens flatten the pictorial space, creating a sense of near-abstraction. Thinly painted, the work relies on subtle tonal gradations, rather than dramatic contrasts. In 1884, Twachtman was studying at the Académie Julian in Paris when he rented a summer home in Arques-la-Bataille (in Normandy) to focus on sketching scenes of this river valley. From these preliminary, naturalistic sketches, he created this work in his Paris studio the following year. This distance from the original scene allowed him to take greater liberties with rearranging and abstracting individual components to create a more unified depiction. Like many American artists of the time who studied or travelled in European artistic circles, Twachtman was influenced by both the example of Whistler's paintings and Japanese woodblock prints. Critics of the day proclaimed that, as Whistler painted night, Twachtman painted day. The translation of light into flat planes of color, arranged along a grid, but asymmetrically composed, reflected the style of Japanese prints, which were also being studied by the Impressionists. Twachtman's work, though similar in subject, remained a carefully made studio production, unlike the loose brushwork and improvisational manner of his Impressionist contemporaries. When he returned to America, these French paintings were considered his masterpieces and were critical in spreading the Tonalist style. The sun rises in this hazy pastoral landscape, revealing a single silhouetted figure walking along a country path. In this brief moment of transition from night to day, the shapes of distant trees blur into the clouds where the sun glows framed by leafless branches. The darkness mutes the greens of the foreground, underscoring the solitude and mystery of this isolated figure. Inness's soft brushwork and closely hued palettes softens the edges of each element, creating a scene that is specific enough to be an actual place, but still ambiguous and timeless. The symbolic potential of this work reflects the influence of the scientist and transcendentalist philosopher, Emanuel Swedenborg. Baptized in Swedenborg's church, Inness's late landscapes deliberately sought to create a relationship between nature and spirituality. Capitalizing on the emotive and atmospheric effects of the Tonalist style, he sought to convey "the reality of the unseen." Accordingly, his works sought to depict a state of inner contemplation, an intimate encounter with nature, and also to recreate that sensation for the viewer. The masterful color gradations and his simple, abstracted shapes transform the human figure and two central trees into nearly equivalent sentinels who contemplate the coming dawn. This unconventional landscape is dominated by a nearly black foreground, broken by a lake bathed in moonlight. To the right, the shadowed shape of a black tree frames the mottled light of the sky, where the moon is a pale glowing orb. Blakelock was known for his experimental Tonalism, where he deviated both from the narrative approach of his contemporaries and their smoothly brushed canvases. Instead of the typical gradations of blues, greens, and grays, in this work a heavy, monochromatic black is varied by the yellow moonlight; the sharp color contrast is united through the physical intertwining of the choppy brushstroke, which creates an abstracting texture. This highly unfinished style distorted his subjects and added to their mysterious nature. Indeed, the mood evoked by the work is heavily embodied in the elemental forms of land, water, and sky to which the landscape has been reduced. In a time-consuming and highly experimental process, Blakelock built up the surface of the canvas and then buffed and polished the surface, often using heavy and multiple coats of lacquer. The feathery texture can be most readily seen in his treatment of the moonlight sky. This emphasis on the physical surface of the painting, combined with the shadowy forms depicted, simultaneously suggest the painting as a flat space and one with perceptible depth. The manipulation of the landscape to create rhythmic patterning is clearly seen in Tryon's Tonalist paintings. This landscape, depicting a muted green pasture with a marshy pond in its center, is subtly composed of horizontal and vertical lines. The line of the horizon, lit by the sunrise, is emphasized by the parallel lines of tree-lined border to the meadow and its grassy patches that spread across the view. The line of tall trees creates a vertical thrust into the muted blue grey sky, while their foliage creates another horizontal register. These parallel lines were meant to function like musical phrasing, a theoretical notion unique to Tryon's Tonalism. Tryon said of painting that, "the less imitation, the more suggestion and hence more poetry." Furthermore, each form in this painting seems to absorb color from its surroundings: the green of the meadow takes on the dark shades of earth, the pond reflects the light of the sunrise, the trees absorb the sky's yellow and the blue and green of the meadow. As a result, the work has a pervasive harmony that amplifies the symbolism of its subject: the awakening of morning is mirrored by a landscape of contemplative quiet, but one that hums with the beginning of exuberance. The influence of Tryon's horizontal and vertical lines of composition can be seen in the contemporary works of Wolf Kahn, such as Green at the Bottom, Blue at the Top (2016), which depicts a row of birch trees that fill the canvas from left to right. In Kahn's version, the Tonalist palette is replaced by a progression of vibrant green and orange. The bucolic scene of three cows, standing quietly in a sunlit pond, is enlivened by Ryder's unusual and dynamic framing: twisted and entwined trees rise on the left, arch over the top of the canvas to merge with swirling foliage and color from the right. The effect is akin to the eye of a storm, with a calm center encircled by energetic movement. The pastoral scene recalls Théodore Rousseau's Forest of Fontainebleau, Morning (1849-1851), which depicts cattle drinking from a forest pond, lit in a golden glow. Yet Ryder brings to this interpretation his signature sense of mystery. Employing a Tonalist sense of harmonious color and atmospheric haze, he also reduces the elements of the scene and creates a fragmentary view. The twisting trunks of the trees convey a sense of cosmic energy, while the center circle and the dissolving ground makes the scene feel like an apparition or a view into another world. In their solidity and simplicity, the three cows suggest something primal and symbolic. This visionary quality distinguished Ryder among the Tonalists and influenced the development of Symbolism. Of the Tonalist group, his evocative and painterly canvases cast the longest shadow into the 20th century, influencing many artists, including Marsden Hartley and Jackson Pollock. The Tonalist sensibilities were quickly adopted by Pictorialist photographers, who approximated the color gradations and softly abstracted forms by manipulating their processes of exposure and printing. Steichen, who also painted in the Tonalist style, demonstrates this photographic adaptation in his romanticized image of the Flatiron building in New York. The recently constructed, modern cast-iron building is softened in the twilight photograph, framed by the black traceries of a leafless tree, the rain-glistened foreground, a shadowy figure, and the outline of distant buildings. The distinctive triangular form of the Flatiron is a dark monolith, slowly rising through the center of the print. Influenced by the composition of Japanese woodblock prints, Steichen creates a contrast between the delicate screen of the tree branches and the dark geometric forms of the buildings to depict the city as a mysterious poetic reverie. The building's pinnacle echoes the shape of the man, conveying a sense of repeated elemental form and a connection between him and his urban environment. While Steichen employed a soft focus and long exposure time to achieve a painterly effect, he also altered the physical photograph to heighten this aesthetic. Using pigment-laden layers of gum arabic and potassium bichromate that he added to the original platinum print, Steichen was able to add color reminiscent of Whistler's Nocturnes. He made three different prints of this image, the first in 1905 and two, including this one, in 1909. Each one is a tonal exploration of different color values; this one emphasizes a greenish blue cast. Both formally and technically, Steichen's mastery of the Tonalist idiom in photography influenced subsequent photographers like Edward Weston, Imogen Cunningham, and Ansel Adams in the ongoing quest to establish photography as a fine art. Two trams pass each other amid a snowy city street, framed by buildings with glowing light strips that fade into the wintry mist. The urban background is suggested by a shadowy spire on the left and the vague shadows of distant structures and faint lights. Beckett's simplification of form abstracts the city, making it nearly unrecognizable. The trams become two murky cubes, the buildings are merely triangular shapes of darkness, and the sky is the empty space of a great inverted triangle that dominates the upper two thirds of the painting. The lights on the buildings are glowing slashes of pinkish orange paint in a work that is otherwise a modulation of tones of grey. Reducing these monumental buildings into indistinct, blocky forms, the viewer is placed in an uncertain and inhospitable space. The headlamps of the two trams in the center become our focus; we stand in the path, straining to see clearly. The sense of being overwhelmed by the blizzard, transforms this ordinary sight into an elemental vision and a struggle against the elements. Beckett brought to Tonalism a minimalist sensibility that made her work influential to the development of Australian Minimalism and Conceptual art.